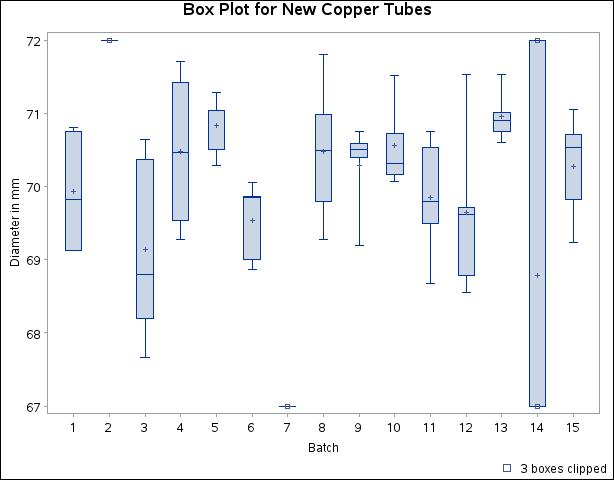 By default a box plot’s vertical axis is scaled to accommodate all the values in all groups. If the variation between groups is large with respect to the variation within groups, or if some groups contain extreme outlier values, the vertical axis scale can become so large that the box-and-whiskers plots are compressed. In such cases, you can clip the extreme values to produce a more readable plot, as illustrated in the following example. The box plot is shown in Figure 28.16. Note that the diameters in batch 2 are significantly larger, and those in batch 7 significantly smaller, than those in most of the other batches. The default vertical axis scaling causes the box-and-whiskers plots to be compressed. The mean of the first quartile values ( ) and the mean of the third quartile values ( ) are computed across all groups. Any statistic greater than or less than is ignored during vertical axis scaling. Clipping is applied only to the plotted statistics and not to the statistics saved in an output data set. A special symbol is used for clipped points (the default symbol is a square), and a legend is added to the chart indicating the number of boxes that were clipped. 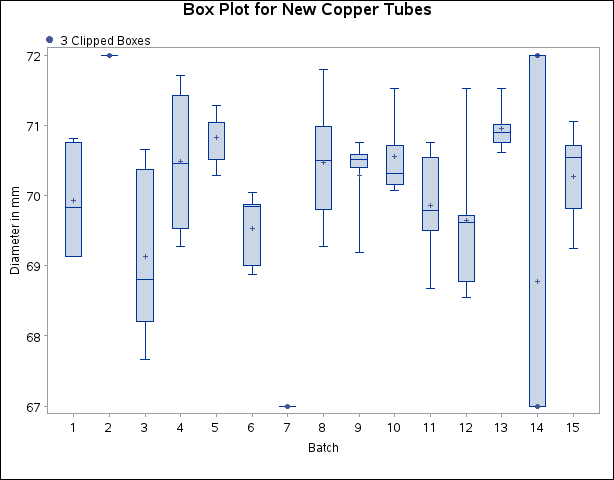 The clipped box plot is shown in Figure 28.17. In Figure 28.17 the extreme values are clipped, making the box plot more readable. The box-and-whiskers plots for batches 2 and 7 are clipped completely, while the plot for batch 14 is clipped at both the top and bottom. Clipped points are marked with a square, and a clipping legend is added at the lower right of the display. Specifying CLIPSYMBOL=DOT marks the clipped points with a dot instead of the default square. Specifying CLIPLEGPOS=TOP positions the clipping legend at the top of the chart. The options CLIPLEGEND='# Clipped Boxes' and CLIPSUBCHAR='#' request the clipping legend “3 Clipped Boxes”. 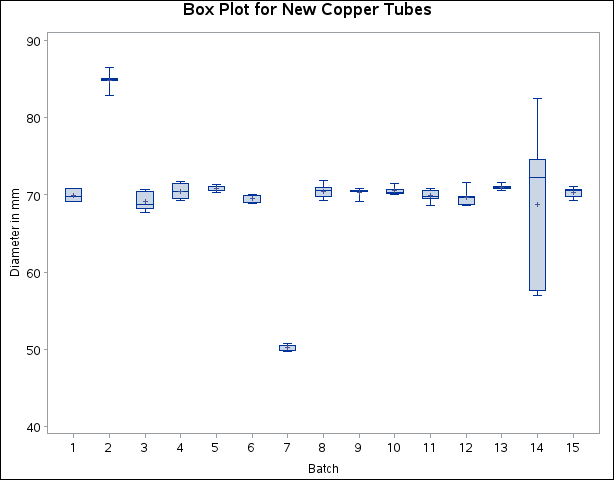 Figure 28.18 shows the modified box plot. For more information about clipping options, see the appropriate entries in the section PLOT Statement Options.